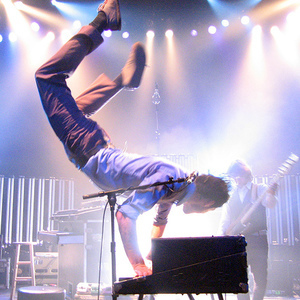 MUTEMATH is an alternative rock band which formed in New Orleans, LA, United States in 2003. They consist of Paul Meany (vocals, Rhodes, keytar, keyboards, samples), Roy Mitchell-C?rdenas (bass, percussion), Darren King (drums, samples), and Todd Gummerman (guitar, keyboards, backing vocals). Since MUTEMATH released its first EP in late 2004 and hit the road in 2005, their inherent nature has challenged limitations and expanded parameters. Since MUTEMATH released its first EP in late 2004 and hit the road in 2005, their inherent nature has challenged limitations and expanded parameters. By the time of the 2006 self-titled debut, their blending of adverse genres into its own innovative sonically adventurous creation earned them a reputation as one of modern music's most daring young groups. By 2007, they would find themselves Grammy nominated and declared by Alternative Press as ?the #1 band you need to see live before you die.? But in the process of pushing boundaries even further for themselves, they almost pushed themselves out of existence during the making of their sophomore album Armistice. ?It was a risk we had to take,? says King looking back on what they set out to accomplish for Armistice. ?This record was by far the most painful music-making experience I've ever had, but also the one I'm most proud of.? The band is best known for their 2007 single ?Typical?, taken from their 2006 self titled album. The song's innovative backwards video was nominated for a Grammy in 2008 for Best Short Form Music Video. Speaking with Songfacts in a 2011 interview, Darren King poked fun at the somewhat futile nomination : "For the rest of our career, we get to say "Grammy nominated band." We don't have to say what it was for. (Laughing)." Mutemath re-enacted the "Typical" video during a live performance on Jimmy Kimmel Live, using the same reverse playback technique used in the original video. The song also peaked at #33 on the Billboard Modern Rock Tracks chart. The band has contributed songs to the major motion pictures Twilight, Transformers, Never Back Down, The Stepfather, The Rocker, and Sisterhood of the Traveling Pants 2. The band has also had their Spotlight and Typical music videos embedded on over 11 million Blackberry smartphones. Along side contributing songs to major motion pictures and product endorsements, MUTEMATH has appeared on every major late night television program including: The Tonight Show with Jay Leno, The Late Show with David Letterman, Late Night with Conan O'Brien, Jimmy Kimmel Live!, and The Late Late Show with Craig Ferguson. In April 2011, it was announced on their official website that founding guitarist Greg Hill had left the band in October 2010. The new album was recorded with other band members filling in on guitar and a new guitarist, Todd Gummerman, was named shortly after Odd Soul was released and he features in most music videos from the album.